Riding along industrial developments, the railroad carries many peoples’ lives and dreams. Various electrical devices are running constantly and anonymously, keeping rail networks operating safely, efficiently, and punctually. In the U.S. alone, the railroad network is over 183,000 miles, which accounts for more than 22% of worldwide rail length. Yet, many freight trains pull long hauls in remote areas without access to electricity and are running blindly. 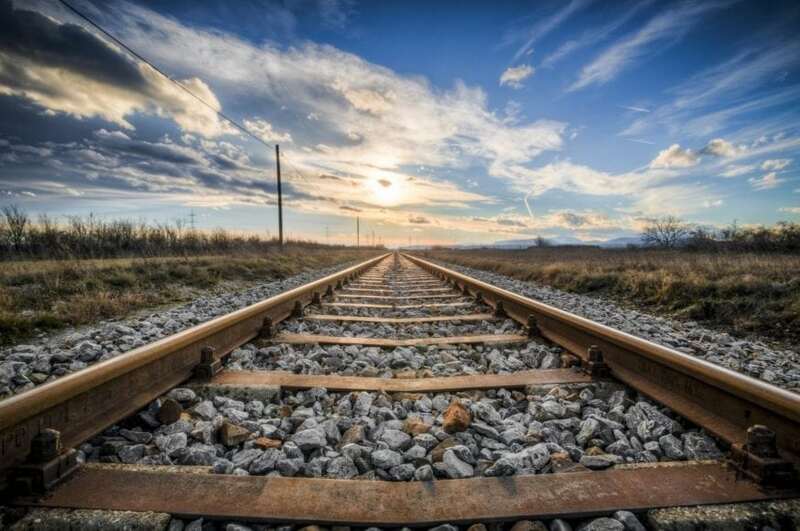 The need for an alternative track-side power supply is urgent; by harnessing energy from train-induced track vibration, trackside devices can be enabled anywhere along the tracks. As a train moves along, the rail track moves up and down from the weight of trains. Along with the high tonnage, the harvestable energy can be tremendous, which can be utilized to power many trackside electrical devices, including warning and signal lights, track switches, grade crossing signals, track-health monitoring systems, wireless communication devices, positive train control systems, and hot boxes. The novel direct motion-driven harvester with anchorless mounting reveals higher power capacity without requiring special preparation during installation. Compared to any traditional anchor, the potential safety risks make it impractical. Furthermore, the cement curing time is too long, which will cause interruption to the train operation. Figure 2 illustrates how the design converts up-and-down motion into continuous rotation. In the diagram, the blue arrows indicate the pinions gear rotation direction when racks move into the page and the right-hand side clutch engages. When the racks move out of the page and the left-hand side clutch engages, pinions rotate in the direction indicated by red arrows. In this regard, the bidirectional (up-and-down) rack motion is rectified into a unidirectional rotation. A full-size prototype was built and tested in lab and field to understand the characteristic of the design as well as predict the power output. To validate the installation and functionality of the proposed design under the real condition, an in-field test was conducted to the prototype at the Transportation Technology Center, Inc. (TTCI) test loop. The test train consisted of approximately 100 freight cars and ran at a constant speed of 64km/h (40mph). In all, the harvester experienced over 200 train passes over one night of test train operation before we recorded data. Anchorless mounting enables the harvester to be easily and quickly installed on the traditional railroad in 30 minutes, which shows its important practical value in field applications. The field tests show a quite high average power of 7W and a peak power of 56W. This shows the harvester design has very promising application for powering track-side electrical devices to assemble a self-powered setup. It also has the potential to power many railroad trackside equipment and electrical infrastructures to improve railroad safety, especially in remote areas or tunnels lacking viable power sources. The energy harvesting technique introduced in this work can also be extended into other energy harvesting fields to regenerate energy from pulse-like vibration. These findings are described in the article entitled Modeling and field testing of an electromagnetic energy harvester for rail tracks with anchorless mounting, recently published in the journal Applied Energy. This work was conducted by Teng Lin and Shikui Chen from Stony Brook University, and Yu Pan and Lei Zuo from Virginia Tech. Lei Zuo, PhD is a mechanical engineering researcher Virginia Polytechnic Institute and State University.